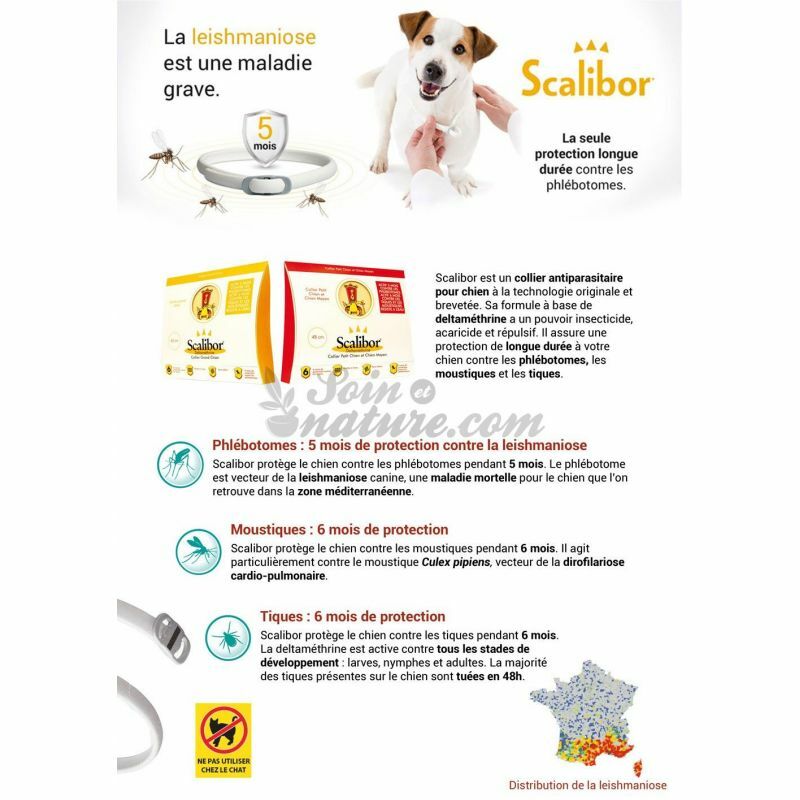 Scalibor is the only collar containing the insecticide allowing your big dog to be protected against sandfly, responsible for the transmission of leishmaniasis. Leishmaniasis is a serious disease of dogs, usually fatal. It's a mosquito called sandfly that transmits the dog dog parasite. There is no vaccine against this disease. In Europe the disease is mainly present in the Mediterranean. Warming causes an intensification of the latter in more northern areas. The first signs are not specific to the disease: hair fall around the eyes and on the muzzle, weight loss. If in doubt, do not hesitate to contact your veterinarian. 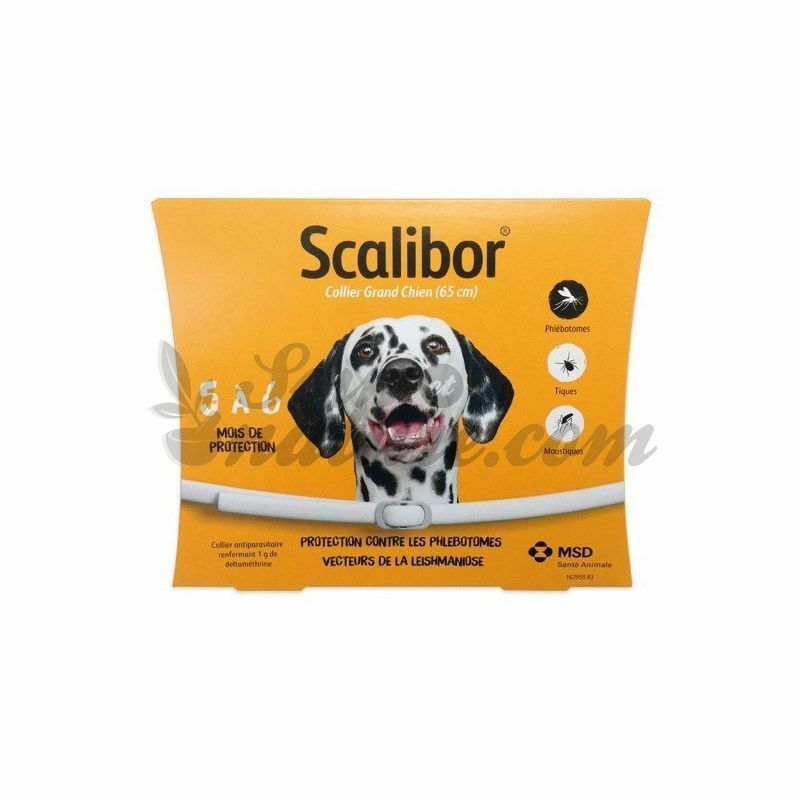 Scalibor is the only collar containing the insecticide allowing your dog to be protected against sandfly and using technology to provide a product release in the lipid layer of the skin. 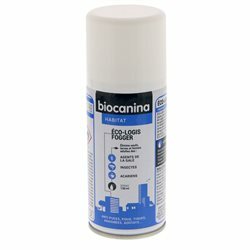 This release prevents the owner to be in contact with the insecticide by evaporation. The collar is effective against sandflies 5 months and 6 months against ticks and Culex mosquitoes. Wipe the necklace with a damp cloth to remove excess powder on its surface. Cut the collar to size leaving a space of two fingers between your dog's skin and collar. Wash hands after placement. The optimal efficiency is obtained at the end of a week. Do not use in puppies under 7 weeks or in a cat. 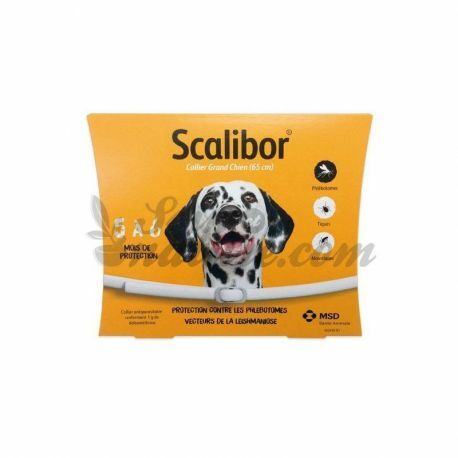 Scalibor is a particularly effective antiparasitic collar that allows you to protect your dog several months. 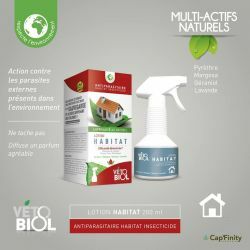 It ensures 6 months protection against mosquitoes (Culex pipiens), 6 months protection against ticks and 5 months of protection against insects transmitting leishmaniasis. In a single step, Scalibor ensures several months of protection. To ensure optimal protection for your dog, follow the instructions that we provide.